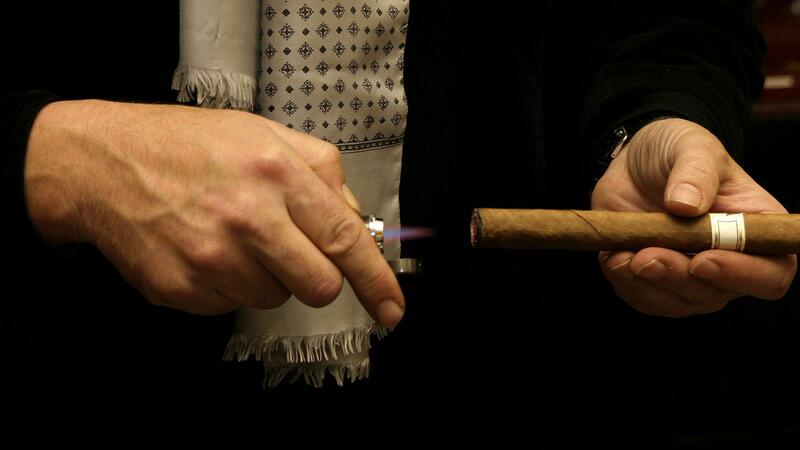 Lighting a cigar is not like lighting the tip of a cigarette or the wick of a candle—it takes longer. In other words, patience is key, especially when you are starting out. Mistakes happen even if you are a seasoned cigar veteran, so just accept it and try not to let errors ruin what should be an enjoyable process. A properly lit cigar is important because it means all the components (wrapper, binder and filler) will be evenly lit, thus imparting the flavors of the blend as the maker intended them to be experienced. Additionally, you won’t be fighting an uneven burn while you're smoking, which can add hassle to a time that should be relaxing. 1. Light your cigar the same way you would toast a marshmallow over a campfire—keep the cigar above and near the flame, but don’t let them touch. Burning a cigar directly in a flame makes it too hot. If you do accidentally nick the cigar with the flame, don’t worry! You haven’t ruined the cigar. Instead, calmly, but quickly, move your smoke back out of the flame. 2. And, as with a marshmallow, you’ll want to rotate the cigar so all parts of its tip are equally heated. Be patient and keep at it until there’s a glowing ring all the way around the cigar’s tip and the edges are thinly blackened. 3. Raise the unlit end of the cigar to your mouth and take the first puff. The ember should burn evenly while drawing, If it doesn’t, take the cigar out of your mouth and go ahead and touch up the end with the flame. You can also try to gently blow on the embers to create a smooth, completely rounded ash. Remember, it's better to avoid lighting a cigar with a flame from a source that will alter the essence of your cigar. Examples include a candle, Zippo and oil-fueled lighters, and standard sulfur matches. These lighting implements can add odd flavors to your smoke. If a cedar spill isn't available, we suggest getting extra-long, wooden matches that are sulfurless. If you can’t find them and must use regular, short matches, be prepared to use a number of them. Be sure to let the sulfur burn off before starting the lighting process and try lighting two at a time, so you get a broader flame. If you're only option is a Zippo or oil-based lighter, let the flame burn for a moment before lighting your cigar. The best way to get the perfect light is to use a lighter designed specifically for cigars, with butane for fuel and a flame (or multiple flames) wide enough to easily light a cigar. There are dozens of different cigar lighters on the market, and which one is best for you is a matter of personal preference. The most important requirement is performance—a lighter should fit easily in your hand, ignite easily, and work without fail every time.